Presented by: R. Kumar Singal & Co. IT Department. 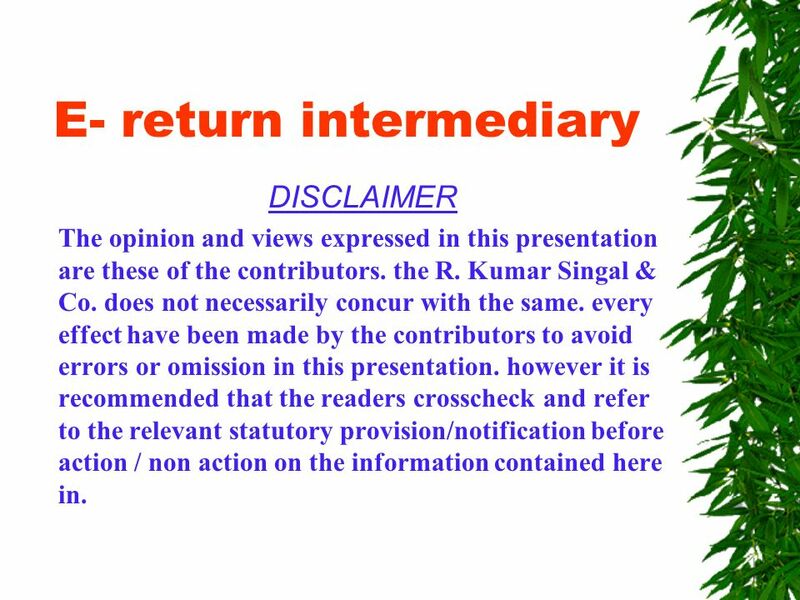 3 E- return intermediary DISCLAIMER The opinion and views expressed in this presentation are these of the contributors. the R. Kumar Singal & Co. does not necessarily concur with the same. every effect have been made by the contributors to avoid errors or omission in this presentation. however it is recommended that the readers crosscheck and refer to the relevant statutory provision/notification before action / non action on the information contained here in. 5 contd. 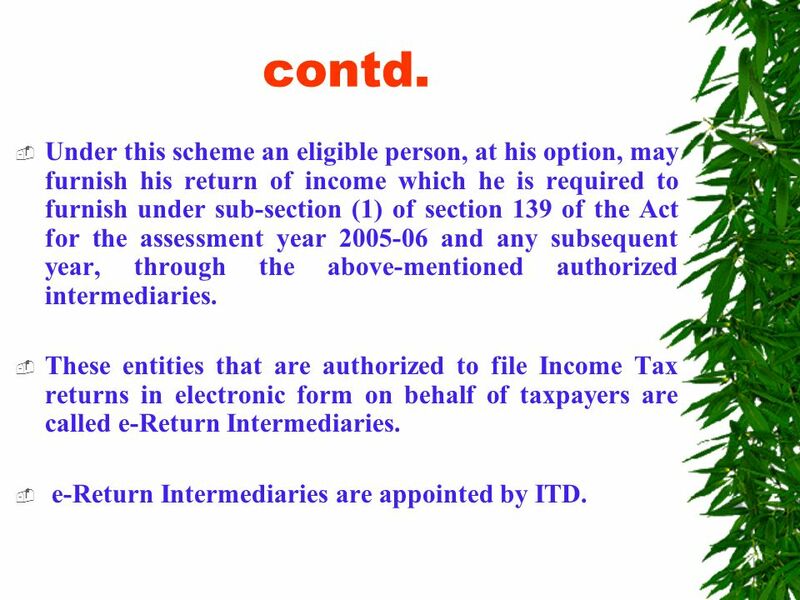 Under this scheme an eligible person, at his option, may furnish his return of income which he is required to furnish under sub-section (1) of section 139 of the Act for the assessment year 2005-06 and any subsequent year, through the above-mentioned authorized intermediaries. These entities that are authorized to file Income Tax returns in electronic form on behalf of taxpayers are called e-Return Intermediaries. 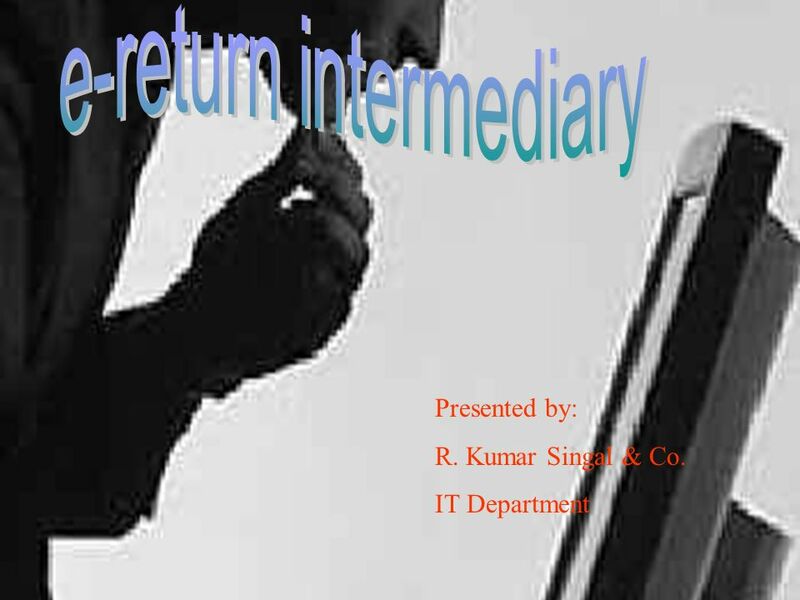 e-Return Intermediaries are appointed by ITD. 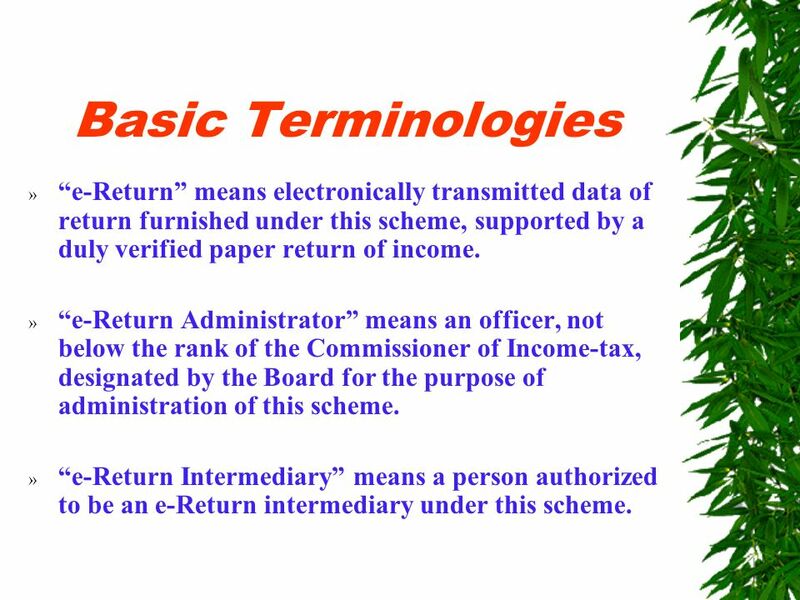 6 Basic Terminologies »e-Return means electronically transmitted data of return furnished under this scheme, supported by a duly verified paper return of income. 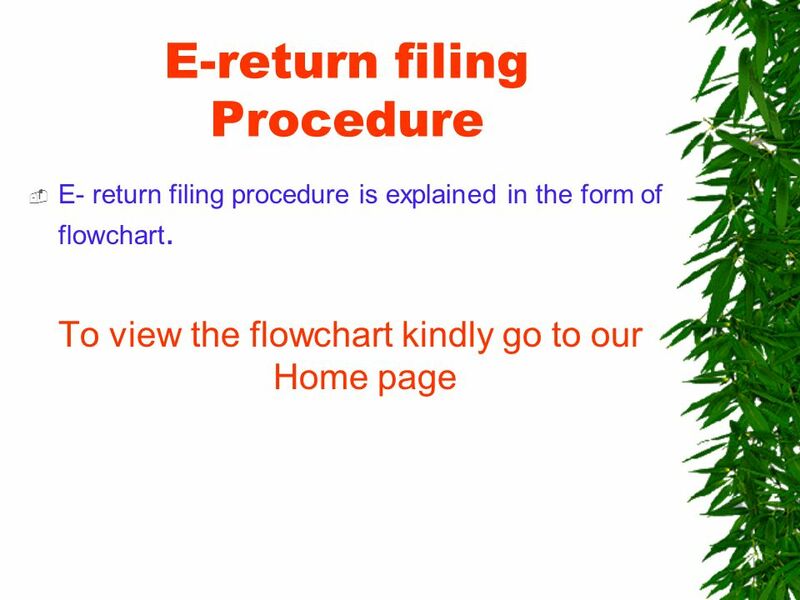 » e-Return Administrator means an officer, not below the rank of the Commissioner of Income-tax, designated by the Board for the purpose of administration of this scheme. » e-Return Intermediary means a person authorized to be an e-Return intermediary under this scheme. 7 Contd …. NSDL has been appointed as the Registrar for processing applications for registration as e-Return Intermediary by eligible entities. 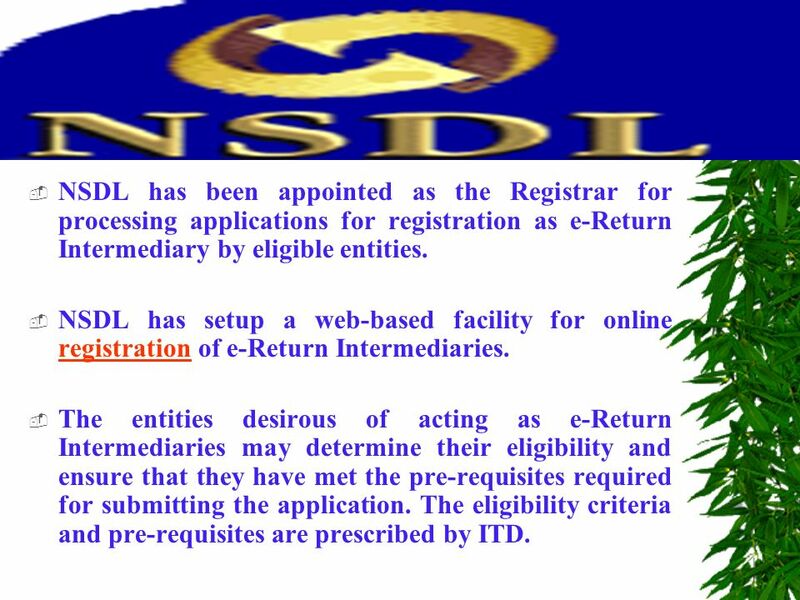 NSDL has setup a web-based facility for online registration of e-Return Intermediaries. registration The entities desirous of acting as e-Return Intermediaries may determine their eligibility and ensure that they have met the pre-requisites required for submitting the application. The eligibility criteria and pre-requisites are prescribed by ITD. 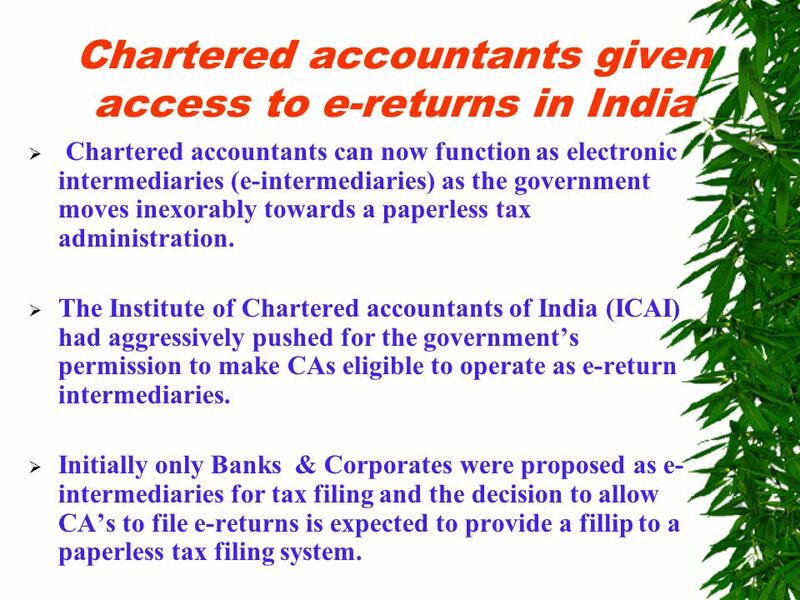 8 Chartered accountants given access to e-returns in India Chartered accountants can now function as electronic intermediaries (e-intermediaries) as the government moves inexorably towards a paperless tax administration. The Institute of Chartered accountants of India (ICAI) had aggressively pushed for the governments permission to make CAs eligible to operate as e-return intermediaries. Initially only Banks & Corporates were proposed as e- intermediaries for tax filing and the decision to allow CAs to file e-returns is expected to provide a fillip to a paperless tax filing system. 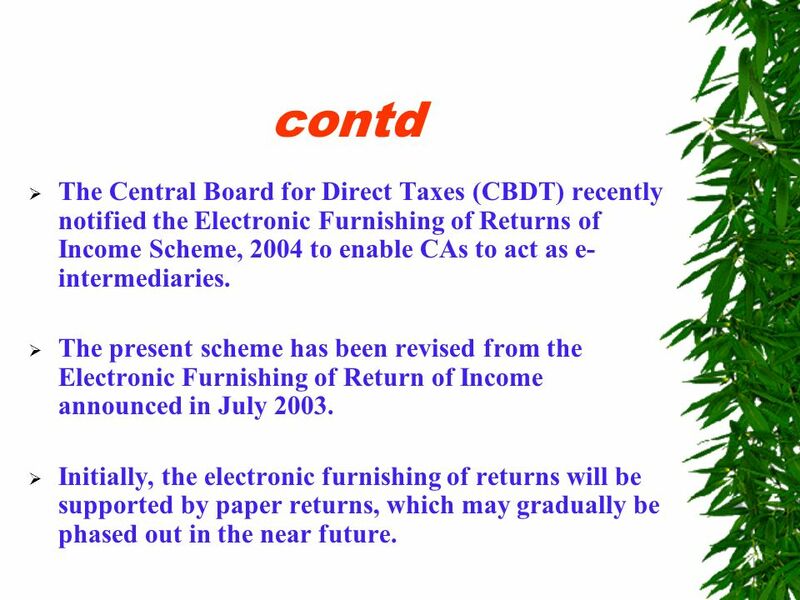 9 contd The Central Board for Direct Taxes (CBDT) recently notified the Electronic Furnishing of Returns of Income Scheme, 2004 to enable CAs to act as e- intermediaries. 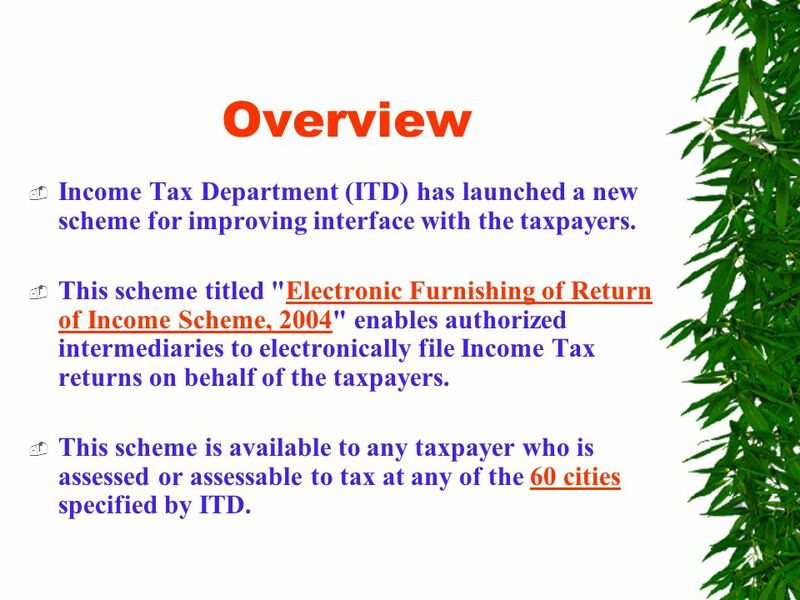 The present scheme has been revised from the Electronic Furnishing of Return of Income announced in July 2003. Initially, the electronic furnishing of returns will be supported by paper returns, which may gradually be phased out in the near future. 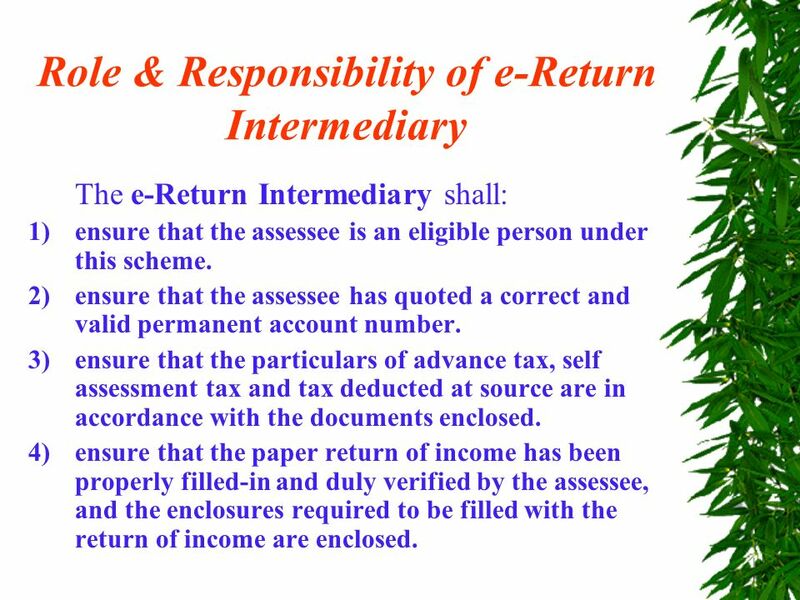 10 Role & Responsibility of e-Return Intermediary The e-Return Intermediary shall: 1)ensure that the assessee is an eligible person under this scheme. 2)ensure that the assessee has quoted a correct and valid permanent account number. 3)ensure that the particulars of advance tax, self assessment tax and tax deducted at source are in accordance with the documents enclosed. 4)ensure that the paper return of income has been properly filled-in and duly verified by the assessee, and the enclosures required to be filled with the return of income are enclosed. 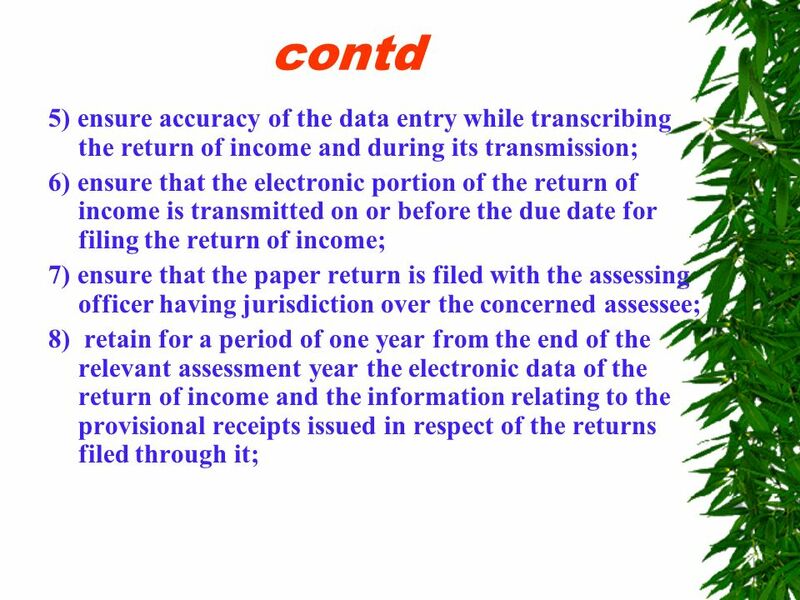 12 contd 9) provide to the assessee a paper copy of the e-return submitted by it and the acknowledgement receipt of paper return filed by e-Return Intermediary to the Assessing Officer. 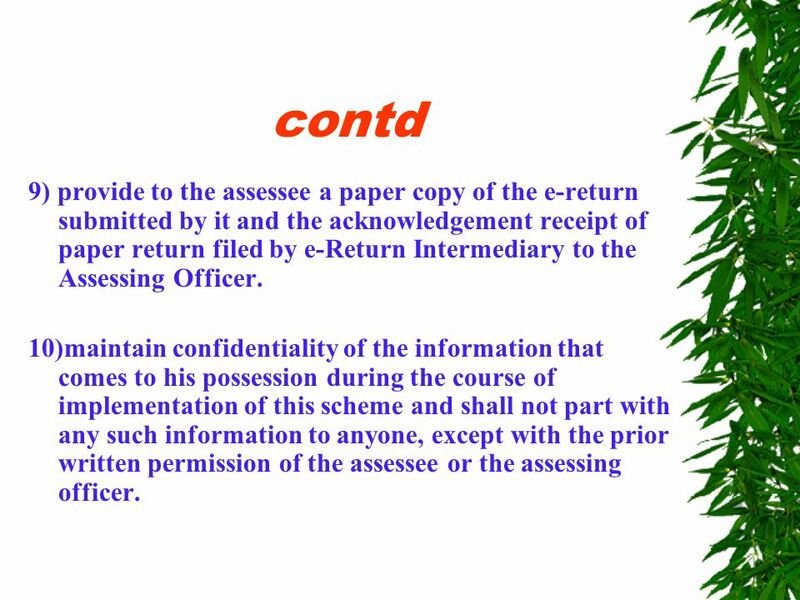 10)maintain confidentiality of the information that comes to his possession during the course of implementation of this scheme and shall not part with any such information to anyone, except with the prior written permission of the assessee or the assessing officer. 13 contd 11) ensure that all his employees, agents, franchisees, etc., adhere to the provisions of this scheme. 12)promptly inform the Registrar of any change in the particulars given in the application filed by it for registration. 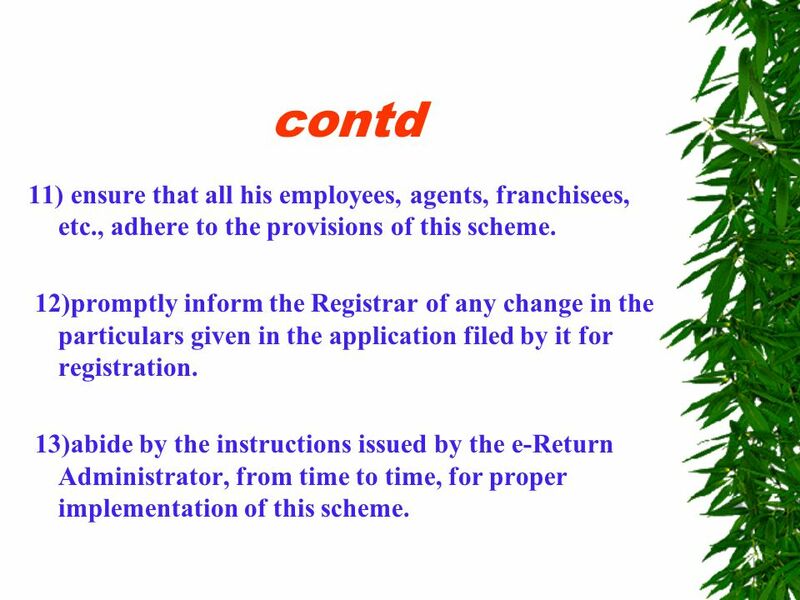 13)abide by the instructions issued by the e-Return Administrator, from time to time, for proper implementation of this scheme. 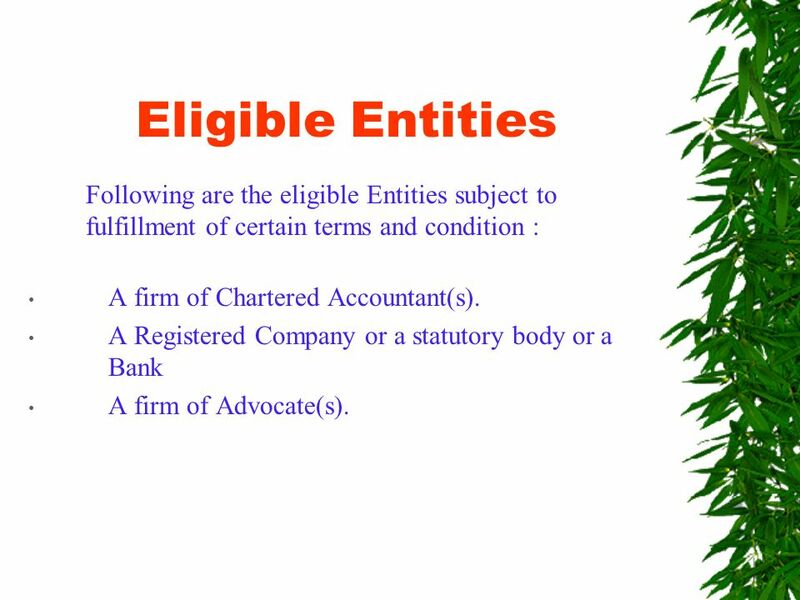 14 Eligible Entities Following are the eligible Entities subject to fulfillment of certain terms and condition : A firm of Chartered Accountant(s). A Registered Company or a statutory body or a Bank A firm of Advocate(s). 15 Pre-requisite i. 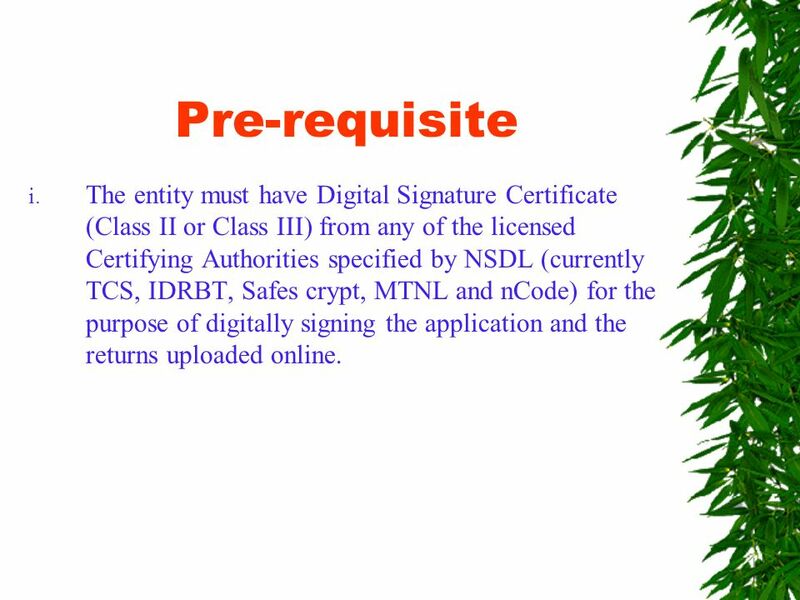 The entity must have Digital Signature Certificate (Class II or Class III) from any of the licensed Certifying Authorities specified by NSDL (currently TCS, IDRBT, Safes crypt, MTNL and nCode) for the purpose of digitally signing the application and the returns uploaded online. 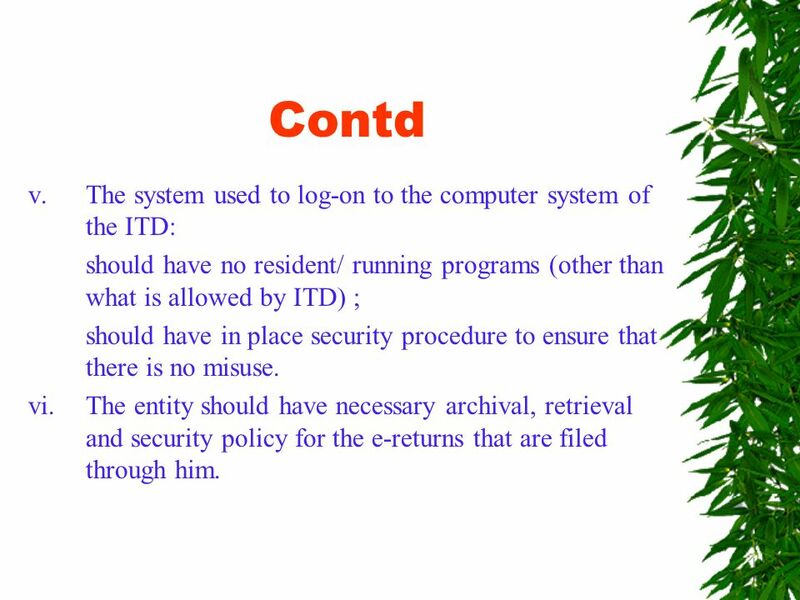 18 Contd v.The system used to log-on to the computer system of the ITD: should have no resident/ running programs (other than what is allowed by ITD) ; should have in place security procedure to ensure that there is no misuse. vi.The entity should have necessary archival, retrieval and security policy for the e-returns that are filed through him. 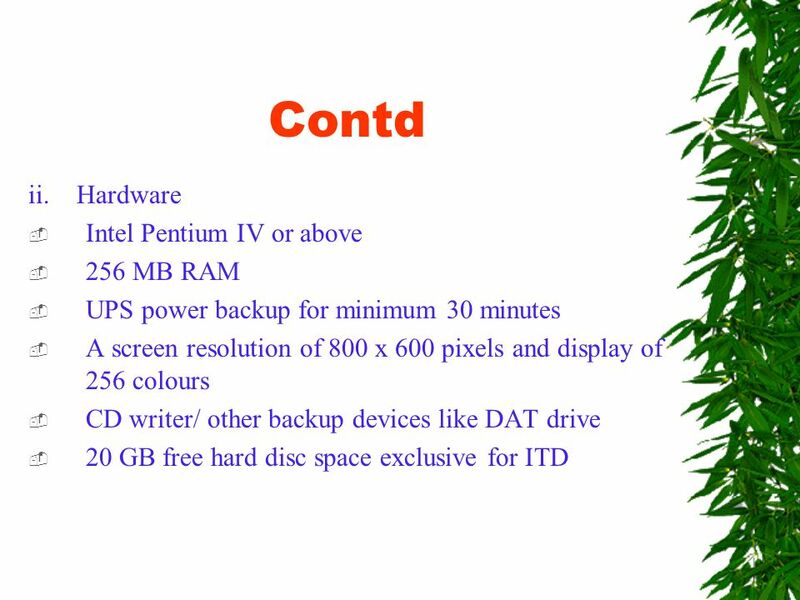 Download ppt "Presented by: R. Kumar Singal & Co. IT Department." Roundtable Meeting on Compliance Aspects of Accounting, Auditing and Regulatory Requirements of Insurance Companies 6 th November, 2007 Hyderabad. System Overview Chapter 1. System Overview 1-2 Objectives Understand Overall Schematic Review Phase 2 Be aware of technical recommendations for new system. 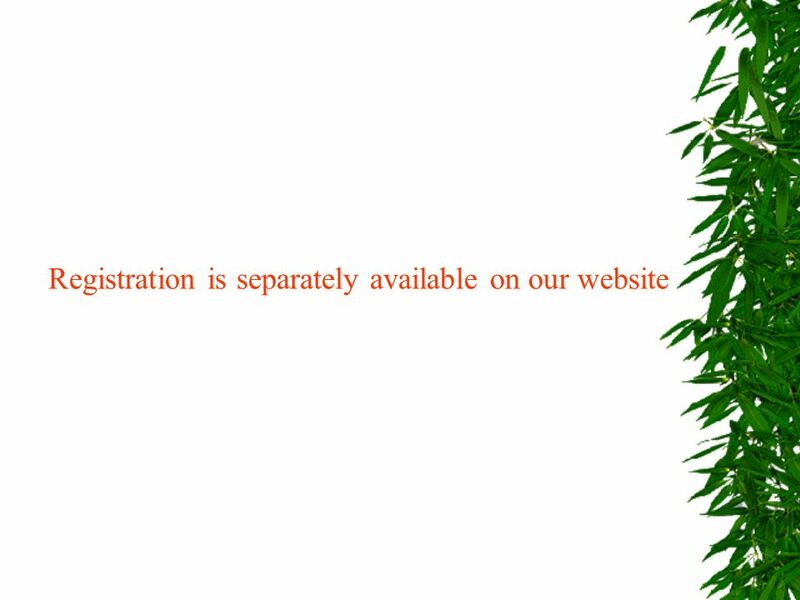 TEAs UserAdministration+ The paperless way to apply for access to TEA SE and its web applications Revised July 2006 [Click mouse to advance from slide. Presentation on 3CD welcomes you to a Winman Software Pvt. Ltd.
Tax Professional (CA) - Registration and Services. Installing Windows XP Professional Using Attended Installation Slide 1 of 30Session 8 Ver. 1.0 CompTIA A+ Certification: A Comprehensive Approach for all. INTRODUCTION A company which is incorporated or formed outside Pakistan which establishes its place of business within Pakistan is called a ‘Foreign Company’.